On December 23rd, I predicted that records would be tied or broken each day from Christmas Eve through December 27th (4 days in a row). As of 5 am, Sunday 12/27, the forecast has been a success. My median forecast error for the high temperatures was 1 degree; the median error for overnight low was 2 degrees. One high temperature record was tied (72º on December 24, 2015 tied the previous set in 1984). On December 25th, Atlanta recorded a high temperature of 75ºF, breaking the previous record of 72º that stood for 28 years (set in 1987) and making Christmas 2015 Atlanta’s warmest Christmas on record.
? Weather History Fact: The warmest Christmas ever recorded in Atlanta, Georgia was 75ºF set in 2015. On Sunday, December 27, Atlanta shattered yet another record. The high temperature was 75º, breaking the previous record of 71º set in 1982. Even more impressive was the morning low of 65º which obliterated the previous record for the warmest low temperature on this date (previous record was 58º set in 1982); further, it is now tied with the 2nd-warmest low temperature ever recorded during the entire month of December! 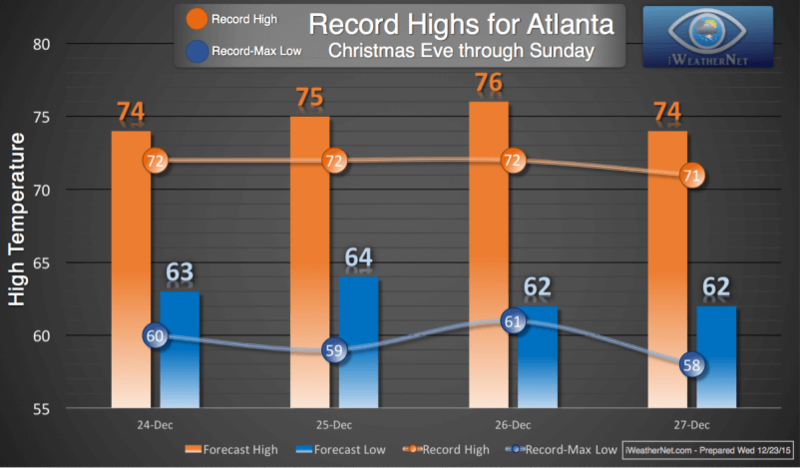 Atlanta will have a very warm Christmas this year with record warmth for the next 4 days. Not only will daytime highs be broken, but Atlanta will also break daily records for the warmest low temperatures. Saturday’s high temperature may be very close to the all-time highest temperature ever recorded during the entire month of December (79º on 12/1/1991). Records for Atlanta date back 137 years. This graphic shows my forecast high/low temperatures (columns) and the daily records (circles) for Christmas Eve through Sunday. We all remember Atlanta’s Christmas Day snowstorm back in 2010. That sure was nice. [wp-svg-icons icon=”drawer-3″ wrap=”span”] View all of Atlanta’s weather records with our database search tool. 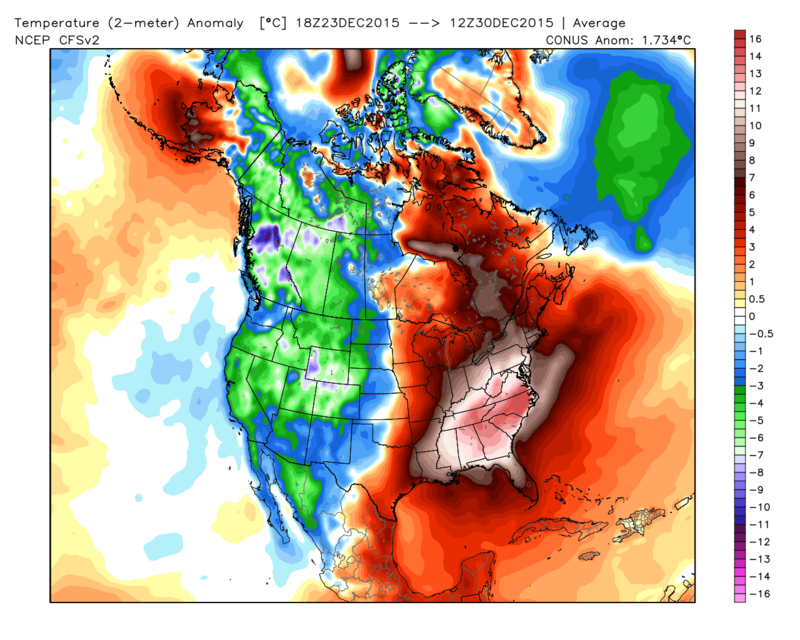 Temperature anomaly for Christmas Week 2015. Image credit: WxBell. Check out some of the fascinating things Doppler weather radar can detect!